This is one of the best coconut cakes I've eaten. It is so good! Another keeper recipe from "Kiss My Bundt" by Chrysta Wilson. A friend was around when I baked this. As soon as the cake came out from the oven, she wanted to try it, as it smells really nice! Well, we waited about 15 minutes, and could not wait any longer! She took a slice, goes "Wow" and ended up taking half the cake home with her. That's where the missing half went! This cake is really moist, soft, crumbly and delicious! I did make a few changes. While this recipe does not call for coconut flakes, I added in about 3/4 cup of sweetened coconut flakes which I wanted to use up. I guess the coconut flakes gives a crumbly texture to the cake, but it is so good, I would suggest not to skip the coconut flakes, it makes a wonderful addition to the texture and taste of the cake. Instead of using the quantity of milk and coconut milk as given in the recipe, I switched the quantity the other way round (see recipe below). The coconut milk I used is "Cholestorel Free", I wonder if that's possible, but that's what printed on the pack! Next, I do not have coconut extract, so I use my own homemade rum-vanilla extract, mmm.... smells heavenly. And as usual, the amount of sugar would usually be the first ingredient that I would adjust. I only use 180gm instead of 1-3/4 cup (320gm) as stated in the recipe, and the sweetness is just right. The cake gets a little bit more sweeter the next day. This is one of the cakes that gets really good after sitting overnight. It's a good thing that my friend took half of the cake, otherwise I'll be eating more than I should! This is really good with a cup of tea. Sift flour and baking powder and salt together. (Mix in coconut flakes). Set aside. Beat butter with an electric mixer until soft, about 2 minutes. Slowly add the sugar. Mix for about 2 minutes. Mix vanilla, coconut extract (optional) and the two milks together. Transfer batter to cake pan than have been coated with a baker's cooking spray that includes flour (or greased and floured), filling until cavity is about 3/4 full. Bake cake until an inserted toothpick or cake tester comes out clean - about 40 minutes for a big bundt. Invert cake onto a cooling rack or serving plate. If cake resists, cool in the pan for 15 minutes before inverting. (If cake still resists, cool an additional 15 minutes in the pan). Cool completely before frosting at least 1 hour for a big bundt. * Coconut extract is optional but it will intensify the coconut flavour of the cake. For a more rich and exotic cake, you can omit the whole milk and use an additional 3/4 cup of coconut milk instead. This beautiful Birthday Cake was baked by my youngest sister. It is beautiful and delicious, a lovely butter pound cake with scatters of dried cranberries. The other quiche that I baked, is Tomato and Black Olive Tart. Now, this is vegetarian and would be more suitable for adults. If you love tomatoes and olive, then I'm sure you will like this. I love the look of this tart, it looks simply lovely with the tomatoes and olives scattered all over. This would make a great lunch with a plate of fresh green salad. As described by Catherine Atkinson, "This delicious tart has a fresh, rich Mediterranean flavour and is perfect for picnics. If you are taking this tart on a picnic, keep in the tin for easy transporting". To make the pastry, sift the flour into a mixing bowl and rub or cut in the butter until the mixture resembles fine breadcrumbs. Sprinkle over the water and mix to a dough. Knead lightly on a floured surface for a few seconds until smooth. Wrap and chill for 30 minutes. Preheat the oven to 190C/375F/Gas 5. Roll out the pastry thinly and use to line a greased 28x18cm/11x7in loose-based rectangular flan tin (quiche pan). Trim the edges. Line the pastry case with some foil and baking beans, and bake blind for 15 minutes. Remove the foil and beans and bake for a further 5 minutes until the base is crisp. Slice the tomatoes, cube the cheese and finely slice the olives. Place the flan case on a baking sheet and arrange the tomatoes, cheese and olives in it. Mix together the eggs, milk, seasoning and chopped herbs. Pour the egg mixture into the case. Bake for about 40 minutes until just firm and turning golden. Slice hot or cool in the tin, then serve. (my notes : to check whether the filling is well seasoned, I just pour a tablespoon of the egg and milk mixture into a corner of the frying pan (hold frying pan and tilt it) and cook until set, then taste it, add more salt and pepper if necessary before pouring it all on the filling. You would not enjoy a quiche which is not well seasoned! My baking buddies, Lena and Zoe, and myself are going bananas for this Bake-Along. :o) We are free to bake anything we want, provided it has BANANAS. Perfect time for me try out one of Dorie Greenspan's recipes which I have bookmarked for ages, but have never got round to it. Sometimes, a little push or encouragement is all it takes to get something done! Ha! Bananas, the star of our theme! And ripe, sweet, firm mangoes. According to Dorie, bake until the top (crumbles) turns golden brown and the fruit is bubbling. Well, I baked till the top is golden brown and the fruits are really bubbling. But I did not see any crispy topping. Is the topping supposed to be cripsy, Dorie did not mention this, well, don't all crumbles have crispy topping? I should think so, at least right after baking! 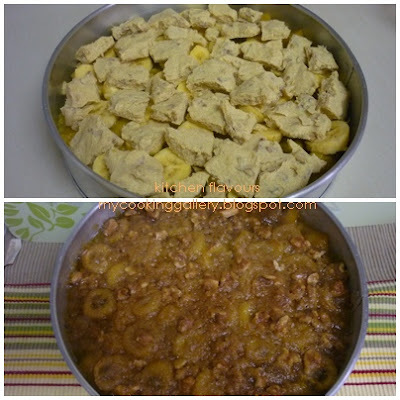 This Tropical Crumble turns out to be a little bit mushy and soft, the bananas have turned mushy when I cooked them, so I ended up using three more bananas which I sliced and place over the top before I scatter over the crumble topping. After I baked this, I then read some post from the baking group "Tuesdays with Dorie", and looks like I'm not the only one with a mushy and soft crumble! I feel that perhaps with a little less butter in the filling, it would not be so watery and mushy. And maybe, by melting the butter and sugar till brown and just toss the fruits in, might help, as once the fruits are soft, the juices would make the filling watery. On the other hand, I guess by browning the fruits, it is more flavourful and fragrant. But all in, whether the top is supposed to be crispy or whether this Tropical Crumble supposed to be soft and juicy, as to what the members of "Tuesdays with Dorie" said, it tasted good. My kids love it, especially topped with vanilla ice cream. Let's hop over to Lena's of Her Frozen Wings and Zoe of Bake For Happy Kids to see them "going bananas" ! Alice of I Love. I Cook. I Bake. has decided to "Go Bananas" and join us for this Bake-Along. Hop over to her blog to see her delicious and gorgeous Chocolate-Caramel-Banana Upside-Down Cake! We will be baking with our next theme "Pizza Nite-In" which will be posted on 06/10. You are welcome to join in. Just post your delicious pizza on 06/10, link back to our post and leave a comment that you have join in the fun, so we can visit you right back! over and add the banana slices. 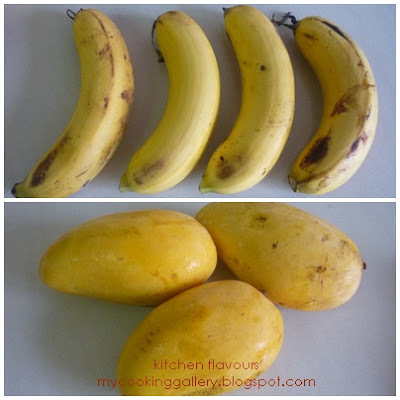 Cook for another 3 minutes, turning the bananas after a minute or two, until both the mangoes and bananas are browned. Keep the heat high and don't move the fruit around too much - you want the fruit to hold its shape and its texture. Transfer the fruit and whatever juices remain in the pan to a heatproof bowl. Gently stir in the chopped ginger, ground ginger, and lime zest. Set aside while you make the streusel. You can make the streusel in a food processor or with a mixer, but I like to make it by hand. Toss the butter into a bowl and, using a rubber spatula, work it until it is smooth. Work in the brown sugar and salt, and then, when the mixture is smooth, stir in the flour, followed by the pecans. Spread the streusel mixture on a pieces of wax paper, fold over the paper and freeze for 20 minutes while you preheat the oven. Center a rack in the oven and preheat the oven to 400 degrees F. Butter a 9-inch pie pan (regular or deep-dish) and place it on a baking sheet lined with parchment or a silicone mat. Spoon the fruit and its liquid into the pie pan. Remove the streusel mix from the freezer and, using your fingers, break the mixture up into topping-size chunks. Don't make the pieces teensy and don't try to make them even - higgledy-piggledy is the way to go. Scatter the pieces over the fruit. Slide the baking sheet into the oven and lower the oven temperature to 350 degrees F. Bake the crumble for about 35 minutes, or until the topping is richly golden and the fruits are bubbling steadily. Transfer the baking sheet to a rack and allow the crumble to cool to your preferred serving temperature - just warm or at room temperature. Set out spoons, rather than forks, spoon out portion of the crumble into dessert bowls and top with whipped cream, runny creme fraiche, sour cream or vanilla ice cream. This is best eaten the day it is made. If you do keep it, cover it, stow it in the fridge and serve it slightly chilled. When it comes to my favourite dried fruits, cranberries comes right after dried apricots. I love dried cranberries almost as much as dried apricots, and recipes that use these ingredients will definitely get a second glance. The cover of this book got my attention, look at the beautiful speckled of cranberries in that lovely loaf of bread. This is a lovely, dense, soft and sweet bread, really tasty and good eaten on its own. The addition of the desiccated coconut adds a light pleasant aroma and really goes well with the dried cranberries. It is not as soft on the second day, but still as good! It has a soft texture, eat it while still warm, good on its own, no jam is needed, with just a cup of Earl Grey tea for company! Enjoy! Lift the bread pan out of the bread machine and fit the kneader blade. Add the water, milk powder, butter, salt and coconut. Spoon in the flour, make a slight dip in the centre and add the sugar and yeast. Insert the pan into the bread machine. Shut the lid and set to a 750gm (1-1/2 lb) loaf on a sweet setting with a pale crust. Press Start. When the raisin beep sounds, gradually add the cranberries. At the end of the programme, lift the pan out of the machine using oven gloves. Loosen the bread with a plastic spatula, turn it out on to a wire rack and leave to cool. Another simple dish, easy and delicious! The prawns are stir-fried together with coriander roots, lemongrass, chili and garlic, season with with fish sauce, brown sugar and black pepper. Eggs are done, omelette style and filled with some of the stir-fried prawns and wrapped up like a parcel. Top with more prawns, garnish and ready to serve. Yum! Instead of making into one big serving, I separated into four small parcels for individual serving. The kids love it! I sprinkled some coarse black pepper over my portion with some sliced chili and more chopped coriander leaves, yum! Heat half the oil in a wok. Add the garlic, lemongrass, coriander root and chilli and stir-fry for 20 seconds. Add the prawns and stir-fry until they change colour. Add the spring onion, pepper, tablespoon of the fish sauce and brown sugar; toss well and remove. Beat the eggs, remaining fish sauce and 2 tablespoons water until foamy. Add the remaining oil to the wok and swirl around to coat the side. Heat the wok and, when it is very hot, pour in the egg mixture and swirl around the wok. Allow the mixture to set underneath, frequently lifting the edge once set, and tilting the wok a little to let the unset mixture run underneath. Repeat until the omelette is neatly set. Place three-quarters of the prawn mixture in the centre of the omelette and fold in the sides to make a square (or simply fold in half). Slide onto a serving plate and place the remaining mixture on top. Garnish and serve with chilli sauce. A simple, delicious and quick dish that can be done in just minutes. One of my family's favourite, this dish is really good with plain white rice. The saltiness and level of spiciness of the black pepper really depends on the brand of sauce that is used. My favourite is Lee Kum Kee as I find that it is not overly salty and the peppery taste is mild enough, even my kids love it. If you are using other brands, adjust the amount of the sauce accordingly to your preference. Marinate chicken strips with light soy sauce and sesame oil, mix to combine. Keep aside for 15 minutes. Heat oil in wok, swirl to coat sides of wok. When oil is hot, add in chicken pieces and stir-fry till chicken is brown, about 3-5 minutes. Add in onion and stir for about 2-3 minutes, add in the red bell pepper and stir for 2 more minutes till pepper has slightly softened. Add in black pepper sauce, water and oyster sauce. Give a couple of turns to thoroughly combine. Dish out to a serving plate and serve immediately. Sunday was my daughter's birthday and she has requested for a Red Velvet Cake. I have been wanting to make this cake for ages. Since my daughter requested this as her birthday cake, I have no excuse not to make it! A nice cake with cream cheese frosting and a simple decoration of fresh fruits. The original recipes calls for raspberries and blueberries. I use strawberries and grapes instead. Happy 13th Birthday to our dear daughter! The cake is moist and has a lovely velvety soft smooth texture, it goes really well with the cream cheese frosting. And the strawberries and grapes adds a wonderful addition. This is a lovely cake to have for any occasion! Really good! Preheat oven to 350degrees F. Butter and flour two 9-inch diameter cake pans, with 1-1/2 inch-high sides. Sift flour, cocoa, baking powder, baking soda and salt into medium bowl. Whisk buttermilk, food colouring, vinegar, and vanilla in small bowl to blend. Using electric mixer, beat sugar and butter in large bowl until well blended. Beat in eggs 1 at a time. Beat in dry ingredients in 4 additions alternately with the buttermilk mixture in 3 additions. Divide batter between prepared pans. Bake cakes until tester inserted into center comes out clean, about 27 minutes. Cool in pans on wire rack 10 minutes. Cut around pan sides to loosen cakes. Turn cakes out onto racks, cool completely. Using electric mixer, beat cream cheese and butter in large bowl until smooth. Beat in vanilla. Add sugar and beat until smooth. Place 1 cake layer, flat side up, on platter. Spread 1 cup frosting over. Arrange 1 container raspberries and 1/2 container blueberries atop frosting, pressing lightly to adhere. Top with second cake layer, flat side down. Spread remaining frosting over top and sides of cake. Arrange remaining berries decoratively over top of cake. Do Ahead : Can be made 1 day ahead. Cover with cake dome and refrigerate. Let stand at room temperature 1 hour before serving. For our Bake-Along No. 9, together with my baking buddies, Lena and Zoe, we made this Sweet Potato Rolls, recipe taken from King Arthur Flour's website. This was supposed to be made into 6 large Sandwich Rolls, but I baked them as a bun-pan, using a 9" square baking pan and divide the dough into nine small buns. These rolls has a beautiful colour from the sweet potatoes. It turned out soft but not as fluffy soft as I expect it to be, but it tasted very good. And it does not stay soft for long, it has turn kind of 'stale' the very next morning. I use the bread machine to knead the dough, and used up the reserved 1/2 cup flour as the dough was very sticky, sticking on my fingers. Maybe I should not have added all of the 1/2 cup in, but the recipe says that the dough should be soft and not sticky. Even with the addition of the reserved flour, the dough is still slightly sticky, but I've decided not to add anymore flour. At first, I was tempted to use Bread Flour but decided at the last minute, to use all-purpose flour as stated in the recipe. I'm not sure whether by using Bread Flour would make any difference to the texture of the bun for this recipe. Overall rating, I'm not very pleased with how my buns turned out. Let's visit Lena of Her Frozen Wings and Zoe of Bake For Happy Kids, they have done a great job with their Sweet Potato Rolls. I'm glad that they have enjoyed these rolls. For our next Bake-Along, we are going with a theme, "Going Bananas", which we will post on 22/09. Feel free to join in, just bake anything with banana as one of the ingredients and post it on that date, linking back to our posts. 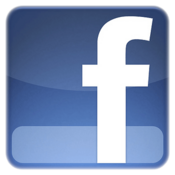 And remember to leave a comment that you have join in the fun, so that we can visit you right back. Place all of the ingredients (holding back 1/2 cup of the all-purpose flour) into the bowl of your mixer or the bucket of your bread machine, set up for the dough cycle. Mix until you've form a soft, but not sticky dough. Add more flour from your reserved amount if needed to achieve the correct consistency. Knead the dough for 6 minutes, then place it in a greased bowl, cover and let rise for 45 minutes to an hour; it will almost double in size and look puffy. 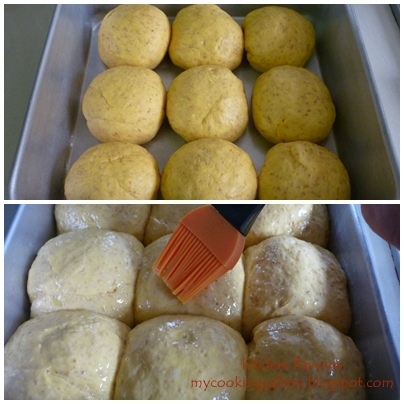 After the first rise, deflate the dough and divide it into 6 pieces. You can roll each piece into a ball, then flatten it to make it 3/4-inch thick (this give it a large enough diameter to fit your sandwich on after baking). Or you can roll each piece into a 12 to 14-inch rope, and form into a Kaiser roll shape. Place the rolls either in a hamburger bun pan or on a lightly greased or parchment-lined baking sheet. Cover with greased plastic wrap, and let rise for 25 to 30 minutes, until almost doubled. Brush the tops of the rolls with the beaten egg, and sprinkle with sesame seeds, if using. Bake in a preheated 375F oven for 17 to 19 minutes, until the tops are a rich golden brown colour, and the centers read above 190F when measured with an instant-read thermometer. Remove the rolls from the oven and cool on a rack for 5 minutes, before removing from the pan and returning to the rack to cool completely. The 7-link tag game has been circling round the bloggerland and this time I have been tagged by Julie from Tasty Treat and Food Glorious Food from My Personal Food Journal to carry on the game. The blogger who is tagged in this game must select the most appropriate posts from her blog for the categories below. The most beautiful post : Pineapple-Rosemary Sorbet . The pineapple gave a gorgeous and beautiful colour to the sorbet and it makes a really delicious, flavourful and refreshing sorbet. Looking at the delightful sorbet make me want to dig right in! The most popular post : Kenny Rogers' Corn Muffins. I have never expected this muffin to be the most popular post! The most controversial post : I could not find any that fits this! The most helpful post : Butterscotch and Hazelnut Pudding. The most helpful tip that I've learnt while making this Pudding, is to never pour water in a baking pan that has joint corners, as the water can seep out from the joints! I have learnt my lesson, something that I would not forget easily! The post that was surprisingly successful : Chocolate-Caramel-Banana Upside-Down Cake. Surprisingly, this post has the most comments. And I have baked this three more times as a gift to friends and family. The post that did not get the attention it deserved. Pumpkin Cake. This is a difficult one to choose, as there are more than one! But I'll just settle for one! This is a really delicious, moist cake, with full flavours from the pumpkin. At the time when I posted this, my blog do not have that many followers or readers, so I guess that's the reason it did not get the attention it deserved. Pumpkin lovers would love this cake! I would like to thank Jay from Tasty Appetite who has graciously extended the following two awards to me. If you have not visited Tasty Appetite, its time you do! Jay has a fantastic blog with lots of delicious recipes. Stop by Tasty Appetite, you'll be amazed by the many fabulous varieties of Indian cuisines that Jay has shared! Thank you so much, Jay! Light, spongy, lovely golden cake. This is the perfect cake to have if you are looking for something light. Another keeper from Tish Boyle's "The Cake Book". There's only 4 tablespoons of butter in this lovely cake. It is not actually fat-free, but really, at least you can have more than a slice without worrying about all that fat! This cake is so spongy and soft. As what Tish Boyle describes "A gloriously moist and tender all-purpose sponge cake with a fine crumb and lovely golden colour". Position a rack in the center of the oven and preheat the oven to 350F. Grease the bottom and sides of a 9-inch cake pan. Dust the pan with flour. Sift together the cake flour, baking powder and salt two times. Set aside. In a small saucepan, combine the milk and butter and heat over medium heat just until the butter is melted. Remove the pan from the heat and set aside. In the bowl of an electric mixer, using the whisk attachment, beat the eggs at high speed until blended, about 1 minute. Gradually add the sugar and vanilla extract and beat until pale and tripled in volume, about 6 minutes. Sift one-third of the flour mixture over the egg mixture and gently fold it in with a rubber spatula. Repeat with the remaining flour mixture in two more additions. Reheat the milk mixture to just under a boil. Add it all at once to the egg mixture and gently fold it in. Scrape the batter into the prepared pan. Bake the cake for 20 to 25 minutes, until it springs back when lightly touched and a cake tester inserted into the center comes out clean. Cool the cake in the pan on a wire rack for 10 minutes. Run a paring knife around the edge of the pan and invert the cake onto the wire rack. Re-invert the cake, so that it is right side up, and cool completely. Store in an airtight container at room temperature for up to 3 days, or refrigerate for up to a week. This muffin is so soft, moist and fluffy with tender crumbs. I found this recipe from "Good Housekeeping" magazine. A perfect muffin to snack on with a glass of cold milk, or for me, a cup of coffee. Perfectly moist, soft and fluffy, even on the third day! Preheat the oven to 190C (170C fan) mark 5. Line a 12-hole muffin tin with paper cases. Melt the butter and plain chocolate in a heatproof bowl over a pan of barely simmering water, making sure the base doesn't touch the water. Mix together very gently and leave to cool a little. Meanwhile, put the flour in a large bowl. Add the bicarbonate of soda, cocoa powder, caster sugar, white chocolate and a pinch of salt. Stir everything together. Put the egg, milk, yoghurt and vanilla extract in a jug and beat together. Pour both the egg mix and the chocolate mix on to the dry ingredients, then roughly fold together. Be careful not to overmix, or the muffins won't rise properly. Divide the batter among the paper cases. Bake for 20-25 minutes until well risen and springy. Take each muffin out of the tin and cool on a wire rack before serving.